Last week, Dan and I were lucky enough to vacation in Maui, Hawaii, as it’s now a lot more accessible to our new West Coast home. Always dreaming of visiting this beautiful tropical locale, the experience surpassed our expectations and then some. Needless to say, we lucked out with some spectacular dining experiences, including a gourmet luau called Feast at Lele in Lahaina, West Maui. One of the more gourmet, upscale luaus in Maui, I’d like to say I chose it because of its impeccable quality of food and service, but that wouldn’t be completely accurate. The truth is that because I made our reservations just a day in advance, Feast at Lele still happened to have available spots for us for which we were thankful. Located in the heart of Lahaina, West Maui on the popular Front Street, Feast at Lele is also affiliated with a popular restaurant group in town, which also owns other spots such as Pacific’Os and O’o Farm. The organization has a great reputation for using fine and locally sourced ingredients. Once arriving at the luau, which was situated right on the beach, we were immediately impressed by the beautiful location and the serene atmosphere. Scoring front row seats right by the stage, it also afforded us a great view of a spectacular Maui sunset. In fact, at certain points in the evening, we couldn’t decide what was more beautiful, the show in front of us or that sunset. Divided into four sections (Hawaii, New Zealand, Tahiti, and Samoa), each representing a geographic area that has helped influence Hawaii’s culture, the evening presented a 3-hour program of fine food and entertainment. Hawaii course – Starting with typical Hawaiian cuisine was the way to go. A simple offering of homemade plantain and sweet potato chips with a sweet tomato relish and homemade poi whet our appetite. The chips were hand-cut no doubt and had terrific flavor – not too salty and still very crunchy. Although poi (taro root paste) is an acquired taste, I thought this version was quite good and was perfect to spread on top of the crispy chips. The piece-de-resistance of this course was the traditionally cooked shredded pork and cabbage. 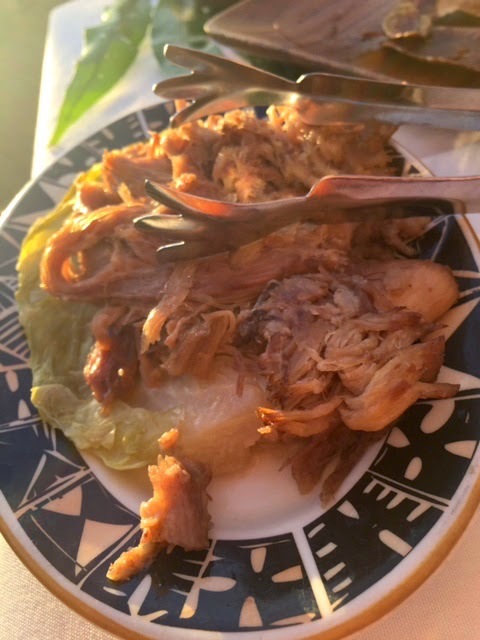 If you’re familiar with Hawaiian traditions, you’ll know that the pork is placed in an underground oven with coals that help it cook. This produces a sweet flavor and a texture that’s to die for, as the pork shreds beautifully and is ever so tender. You don’t need much to accompany it, except for a little bit of that steamed cabbage and some poi if you’re so inclined. It’s also lovely to place on top of your plantain chips. New Zealand course – Presented with more delicious protein, this course welcomed us with tender, marinated steak accompanied by kiwi fruit, soy and ginger, as well as duck tenderloin that was served chilled. The latter stood out to me, as the presentation was unusual and the variety of textures on the plate so varied. From the tender duck to the crispy sweet potato sticks on top and the colorful veggies on the plate, it represented a true celebration of flavor, texture and color. Tahiti course – Another big highlight of the evening for me was the bright, flavorful food offering from Tahiti. The standouts here were the tiny bay scallops au gratin, which were everything a comforting dish should be including creamy, crispy and golden brown on top. The chicken in coconut cream was another winner, producing an almost desserty flavor profile from the sweet coconut and a beautifully tender texture. Samoa course - I loved the non-meat options of this course including the hearty breadfruit and squash, cooked in a taro leaf and once again coconut cream. There was also the refreshing shrimp, avocado and fresh fruit salad that helped make digestion of this hearty meal a little easier. Dessert – As if we didn’t have enough to eat, the dessert course delivered on more color and culinary splendor. Everything on this lovely plate was tasty but the macadamia caramel mini tarts reigned supreme, boasting a creamy middle and a fabulously crunchy crust. The hairy looking things you see on the bottom of the plate are local lychees and those were fabulous too – a great way to refresh the palate. Drinks – In addition to all the food, the luau was an all-you-can-drink kind of deal. It’s hard not to go overboard with this format, as drinks have a tendency to fill me up but I did get my taste of local juices such as guava and a few frozen tropical drinks such as the Banana Madness and the Lava Flow. Compliments to the mixologists here, as everything tasted fresh, fruity and delicious. Having a dedicated server for our drinks as well as food, we were really well taken care of. I loved how on-point everyone was, exemplifying an aura of true professionalism. It was also impressive to see the knowledge that everyone had about the local cuisine and the expert way in which they pronounced the names of all the food. Costs are pretty expensive but hey, we were on vacation and this truly was a unique experience that we couldn’t pass up. Everything including all the food, drinks and entertainment set us back $125/person not including tip. Totally bank breaking, but worth every penny. Mahalo, Feast at Lele!